Something wonderful happened for Nashville sports fans this summer. While the city’s country music stars belted out their smash songs on various downtown stages at the four-day CMA Music Festival, some of Nashville’s most gifted athletes produced an incredible array of hits all summer long on glittering stages across the globe. And now, as we transition from the dog days of summer into autumn’s colorful fall foliage and settle back in the La-Z-Boy to watch the new ABC television show Nashville, let us reflect on some of the glorious sporting feats we witnessed over the past few months. We watched reality TV at its thrilling finest, unreal performances in which Nashville’s boys of summer – little ones and grown-ups alike – basked in the glow of superstardom at the highest levels of competition. “Any one of those accomplishments would be considered outstanding in its own right, but when you put them all together in one summer, you’re not going to find that in any other communities,” says three-time NASCAR champion Darrell Waltrip of Franklin, now a racing analyst for Fox Sports. Perhaps dazzled by the sheer magnitude of how so many unrelated events shared a hometown connection, a Las Vegas sportsbook executive and two Nashville mathematicians mostly agreed that such an occurrence rates off the charts. Maybe, just maybe, the Mayans predicted a 2012 cosmic convergence as Nashville’s sports landscape, when the city’s brightest stars aligned to turn a national – and sometimes international – spotlight on their many achievements. Two 20-game winners, former Murfreesboro Blackman standout David Price (Vanderbilt) and ex-Montgomery Bell Academy star R.A. Dickey (Tennessee), shape up as strong candidates to win their respective league’s Cy Young Awards following the World Series. Leipers Fork resident Dario Franchitti roared to his third Indianapolis 500 victory in late May. Nashville’s Brandt Snedeker, another former MBA great and an All-American for Vanderbilt, became golf’s FedEx Cup champion in Atlanta in late September, earning a staggering $10 million prize for that feat alone. A week later, he competed for the United States in the Ryder Cup. Not only did golf’s FedEx champion hail from Nashville, but so did this summer’s U.S. Amateur champion. Hendersonville’s Steven Fox (UT-Chattanooga) came from nowhere to win on the 37th hole in mid-August. Former Hillwood standout Brian Baker staged a most unlikely Grand Slam tennis comeback during June and July, reaching Wimbledon’s round of 16. Two Middle Tennesseans, Chapel Hill’s Mike Minor (Forrest, Vanderbilt) and Columbia’s Dan Uggla (Columbia Central, Memphis), went to the National League’s new wild-card playoffs with the Atlanta Braves. Pedro Alvarez (Vanderbilt) hit 30 home runs, giving the Pirates two 30+ HR sluggers in the same season (with Andrew McCutchen) for the first time since 2001 and only the third time in history. Ryan Flaherty (Vanderbilt) reached the American League Division Series with the Baltimore Orioles. And, perhaps, the most amazingly improbable of Nashville’s summer of champions was the Little League World Series run to the U.S. championship by the Goodlettsville 12-year-old All-Stars. The joys of summer were greatly enhanced by Nashville’s boys of summer. 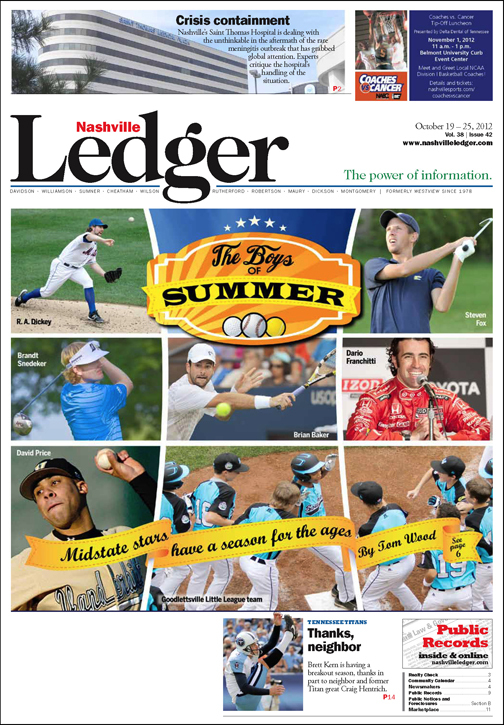 “The accomplishments of the Goodlettsville Little Leaguers were especially thrilling. This team displayed great courage, athleticism and resilience before a national and global audience. “I also followed Brandt Snedeker in his victory in the FedEx Cup. As a young golfer, Brandt played on the city’s courses, notably Shelby and McCabe, and was a past winner of the local municipal golf tournament put on by Metro Parks. I’m proud of the city’s role helping young athletes hone their skills at our parks and other facilities. While men playing kids’ games allowed the rest of us to vicariously live out our sports fantasies, the greatest of Nashville’s 2012 boys of summer were just that — a youth baseball team whose exploits sent spirits soaring and enthralled an entire region. What are the odds of all those events occurring in such a short timespan for one region? One Las Vegas sportsbook executive suggests a minor fortune could have been made if you’d placed a small wager in February on this scenario playing out. “That’s a lot to consider. I don’t know what the numbers would calculate out to, but it would be a big number for all those things to happen,” says Jay Kornegay, sportsbook director of the LVH Race and Sportsbook. Belmont University mathematics professor Mike Pinter says if one looks long enough and hard enough to find a pattern within specifically defined parameters, you will. “But it certainly is unusual, that all these events are happening here. The likelihood of that is pretty small, pretty rare,” Pinter says. Lipscomb University mathematics professor Doy Hollman echoes the sentiment, saying, “Generally, it is very unusual and the probability is very low.” Both professors say they, like the rest of us, followed Nashville’s boys of summer. Who would ever have suggested the 2012 FedEx Cup champion Snedeker and U.S. Amateur champion (Fox now invited to play in the 2013 Masters and U.S. Open) would both hail from the Nashville area, some 20 miles apart? Two-time PGA Tour winner Scott Stallings of Knoxville isn’t that surprised. Meanwhile, Price, a crafty left-hander with the Tampa Bay Rays, and Waltrip were among the legions who hopped aboard the Goodlettsville bandwagon, Tweeting to their followers about the feats of the Goodlettsville team. Vanderbilt baseball coach Tim Corbin even made the trek to Williamsport, Pa., to watch his young fellow Tennesseans. “When you look at it like that, it was an amazingly great summer for Tennessee and Nashville,” says Goodlettsville manager Joey Hale, adding his team appreciated the community support. “It was just really fun talking to major leaguers. We really didn’t think it would be this big,” said Goodlettsville star Brock Myers, who along with Lorenzo Butler provided many of the team’s biggest hits. Corbin says in his 10 years in Nashville baseball he’s never seen this much success on so many levels. “David’s consistent dominance throughout the entire season was extremely impactful to Tampa Bay’s run at a pennant race and would certainly put him at the top of any Cy Young discussions. Mikie Minor’s success is not surprising to anyone in our program. “This was a remarkable summer and so much fun to watch. It made me feel like a kid again, watching these folks,” award-winning veteran WSMV-TV sports anchor Rudy Kalis says. Franchitti got the splendid summer run off to a fast start by winning the Indianapolis 500 on May 27. After the race, he choked up when he dedicated the victory to his friend, 2011 Indy champion Dan Wheldon, who tragically died later in 2011 during a race in Las Vegas. “Our 2012 season was highlighted by the team’s 1-2 finish (with myself and Scott Dixon) in this year’s Indianapolis 500 for Target Chip Ganassi Racing. Anytime you have the biggest car race in the world come down to the last lap of a 500-mile race, it’s exciting. “It is a tremendous honor for me personally to join the very short list of three-time Indianapolis 500 winners in history,” Franchitti says. “I’d like to congratulate all the Nashville-area athletes on their collective accomplishments this season,” he adds. Former Hillwood High School tennis star Brian Baker gave us another feel-good story. He made his first big splash as a junior player, reaching the boys championship in the 2003 French Open before a series of injuries seemingly derailed his career in 2007. He underwent five surgeries over the next several years, including three on his hip, and served as an assistant coach at Belmont before deciding in 2011 to give the pro circuit one last shot. The move paid off when Baker made it to the second round of the French Open and the fourth round at Wimbledon before exiting. Dickey, another 20-game winner, turned in one of the most captivating summers as the toast of New York with the Mets. The knuckleballer, who represented the United States in the 1996 Atlanta Olympics and also spent time on the Nashville Sounds roster, posted a magnificent 20-6 record with 230 strikeouts and a 2.73 ERA in 2012. He recently underwent surgery to repair a torn abdominal muscle, just the latest injury over the span of his career. Other 2012 highlights for Dickey included his first All-Star Game selection, an appearance on Late Night With David Letterman and the release of his autobiography, Wherever I Wind Up: My Quest for Truth, Authenticity and The Perfect Knuckleball. Former Sounds owner Larry Schmittou says he most enjoyed following Dickey’s summer. Former Vanderbilt stars Alvarez of the Pirates and Flaherty of the Orioles also had their moments in the sun. “It was fun to see everyone from here playing on the big stage,” says Vanderbilt broadcaster Joe Fisher, who was on hand for Snedeker’s final round. And wouldn’t it be wonderful to see one last hurrah for Nashville’s boys of summer? Wheaties, the Breakfast of Champions, could put out a commemorative cereal box for the Music City of Champions. (When contacted about this story, a General Mills spokesperson issued the following statement: “Wheaties congratulates Nashville on a tremendous year of championship performance.) No word about a box of our own. Twenty-twelve was a magic number / for Nashville’s boys of summer.